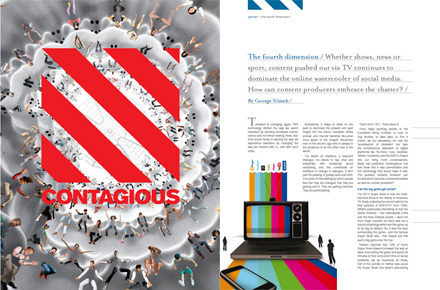 "The 4th Dimension" is an article I wrote that looks at the way real-time social media is changing the way we interact with television. It is from the latest issue of Contagious Magazine, and they've kindly let me share it with you. Whether shows, news or sport, content pushed out via TV continues to dominate the online watercooler of social media. How can content producers embrace the chatter? Television is changing, again. PVR technology shifted the way we watch television by allowing increased control, choice and non-linear viewing. Now, realtime social media is altering the way we experience television by changing the way we interact with it… and with each other. Sometimes, it helps to draw on the past to illuminate the present and gain insight into the future. Canadian media scholar and theorist Marshall McLuhan once spoke of the ‘angelic discarnate man of the electric age who is always in the presence of all the other men in the world’. That’s from 1971. Think about it. From major sporting events, to the Eurovision Song Contest, to Lost, to Big Brother, to Mad Men, to The X Factor, we are witnessing not only the ‘socialisation of television’ but also the simultaneous extension of digital platforms like YouTube, Hulu, SeeSaw, Twitter, Facebook, and the BBC’s iPlayer into our living room conversations. Many had predicted ‘convergence’ but few knew that it was conversation and not technology that would make it real. The question remains, however: can broadcasters become conversationalists as well as content providers? Can the big game get social? The 2010 Super Bowl is now the most watched show in the history of American TV, finally eclipsing the record held by the final episode of M*A*S*H* from 1983. What’s particularly interesting is that the teams involved – the Indianapolis Colts and the New Orleans Saints – were not from ‘major markets’, so there was not a natural advantage which set this game up to be big by default. No, it was the buzz surrounding the game… and the famous Super Bowl ads… that helped put this year’s big game over the top. Nielsen reported that 14% of home Super Bowl viewers browsed the web at least once during the game and spent 29 minutes of their concurrent time on social networks, led by Facebook. At times, half of the activity on Twitter was about the Super Bowl. But what’s astounding is the apparent lack of interest shown by the NFL to get involved and tap into this valuable conversation. Sure, the NFL created a Super Bowl hashtag for Twitter. But really, is that it? Advertising agency Mullen in Boston and social media monitors Radian6, New Brunswick teamed up to create ‘BrandBowl2010’ which monitored close to 100,000 tweets during the Super Bowl. They combined volume, sentiment and other metrics to generate real-time ratings of the ads. Doritos scored highest. Google and Christian organisation Focus on the Family also did well, the latter proving you can be controversial and social. It had been years since I had watched the Eurovision Song Contest, but the 2009 competition was one of the best shows I’ve seen in a long time. I say this not because I was particularly enthralled by Norway’s Alexander Rybak’s violin skills, but rather because my circle of friends and followers online all spent a very enjoyable evening in the comfort of our own homes talking, tweeting, posting and sharing our thoughts – in real-time – about the contest. It was fun, involving, and highly social, and yet it seemingly flew below the radar of anyone involved with the show at the time. What people say about Eurovision and the contest’s participants varies greatly and might provide sceptics with reasons to play down the importance of social media or play up its risks. However, in this age of intense media fragmentation and countless content alternatives, the strategic embrace of it will increase viewership, and that’s a good thing. The theme for the 55th Eurovision Song Contest in May 2010 is ‘Share The Moment’, and producers claim they ‘want to share the Eurovision Song Contest, rather than just broadcast it’. So far the Fan Edition of the site consists of little more than a Facebook Connect box linked to their fan page. A much deeper integration of the social stream surrounding the contest is what’s needed, and I guess we’ll have to tune in to see if they can pull it off. CNN stands out for the way it integrates social media into how we experience television. The popularity of its public journalism initiative, iReport, has inspired a number of similar initiatives by other news organisations including ABC i-Caught, Fox uReport, and MSNBC FirstPerson. It has also created opportunities for journalists like CNN’s Rick Sanchez who fully integrates social media and crowdsourcing into his newscasts. When Sanchez’s new show Rick’s List was announced in December 2009, he tweeted that it ‘will be full of newsmakers and thinkers we- and u- think are relevant to CNN. My access = your access’. Crowdsourcing opinion is nothing new – talk radio has been doing that for years – but Sanchez uses Facebook, Twitter, micro video service TwitVid as well as his official CNN blog to amplify and extend his presence, as he takes realtime information and news gathering to a global scale. In the age of social television, networks will not be alone in competing for viewers. YouTube is intrinsically social and shareable, and the hundreds of millions of videos watched every day will continue to push broadcasters to become more social. Are YouTube, Hulu, iPlayer, SeeSaw and others television? Is it ‘television’ when you watch content broadcast from the web on your TV? What about on a mobile device? To re-engage with 15 to 24-year-olds, iris worked with Sony Ericsson to create Pocket TV, a made-for-mobile and web show consisting of five weekly 90-second segments [See Contagious 20]. The shows consist of quirky interviews with musicians and bands that reveal the unrehearsed side of their personalities. The first season of the show had well over three million views and is helping Sony Ericsson become a relevant part of the conversation. Qualitative and quantitative research validated the fact that regular engagement with fans of the show helped shift brand perception from a mere content provider to a company interested in what interests them. The importance of this cannot be understated, as brands who participate in conversations derive benefits ranging from natural word-of-mouth to insight gathered in an unobtrusive and open way. I think there will always be room for couch-potato television. Sometimes, folks want to sit back, relax and just watch. Increasingly, though, people want to lean forward and get involved, and realtime social media is transforming what happens when they do. Below is the full trailer to Contagious Magazine, Issue 22 and you can download a PDF of extracts here.